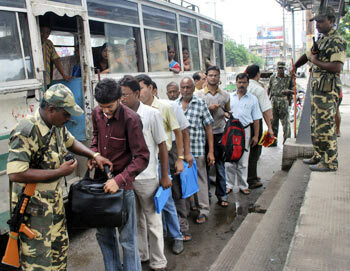 Security personnel were out in force and kept a tight vigil at vital installations, transport terminals, markets and places of worship, especially in the national capital, on the eve of 63rd Independence Day today when Improvised Explosive Devices and bombs were recovered in Jammu region and Assam. Though there was no specific intelligence input of a threat to the celebrations--the first after the Mumbai terror attack, security forces and intelligence agencies were leaving nothing to chance with terror groups, Left wing extremists or insurgents in North-East having the potential to carry out possible suicide terror strikes. 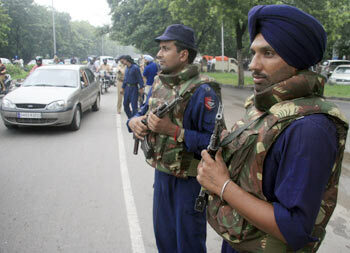 The area around the 17th century Red Fort in New Delhi where Prime Minister Manmohan Singh will unfurl the national tri-colour and address the nation from its ramparts has turned into an impregnable fortess with gun-toting security personnel guarding evey nook and corner. All entry and exit points to the walled city were also regulated. 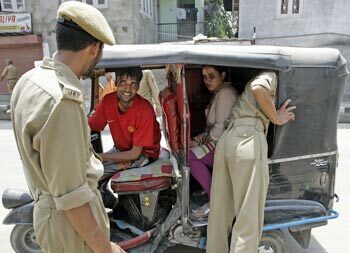 In Jammu and Kashmir, security personnel recovered two Improvised Explosive Devices in Jammu region prompting the security personnel to carryout repeated checks. A major disaster was averted in Assam with seizure of seven powerful IEDs from Guwahati and another from Bongaigaon district after intelligence inputs that United Liberation Front of Asom and National Democratic Front of Bodoland activists might try to disrupt the celebrations. of Control and International Border along Pakistan and Bagladesh. The area around the Red Fort where Singh will be addressing the nation--the first during his second tenure--has been completly sanitised by security and intelligence agencies and the area will be a no-fly zone during the function. Officials of Delhi Police, elite Special Protection Group and National Security Guard along with other security agencies carried out detailed recee of the Red Fort area to thwart any attack. Sharpshooters, dog squads, bomb disposal squads and anti-aircraft and air defence guns have also be deployed and put on high alert as part of security drill around the key installations of the national capital. Snipers of elite National Security Guards will also be positioned on top of high-rise buildings in the old Delhi area around the Red Fort and along the route taken by Prime Minister and other VIPs to reach there. The security agencies will also be maintaining tight vigil around key installations here including Parliament complex, Railway stations, bus-terminus, Indira Gandhi International airport, and metro stations. The borders of National capital will be sealed and tight checking is already going on at all the entry points of the national capital. 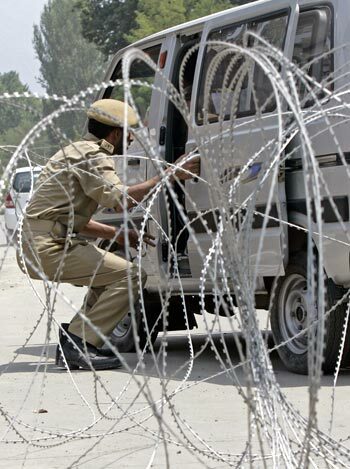 Outside the capital, security has also been tightened in Jammu and Kashmir, West Bengal, Maharashtra, Gujarat, Assam and other North-Eastern states. personnel has been enhanced along the porous Indo-Nepal border to prevent Nepali Maoists from sneaking into the Indian territory to disrupt the celebrations. The security in 13-naxal affected states especially Jharkhand, Chattisgarh and Orissa has been reviewed and efforts have been made to plug all loopholes. A vigil is being maintained to ensure that there is no large grouping of naxal extremists anywhere. A report from Guwahati said security has been put on high alert throughout the state, which has witnessed attacks on railways, oil refineries and vital installations almost every year around Independence Day and Republic Day by ULFA in support of its demand for sovereignty. The Home Ministry advised the states to conduct searches and regular screening at all exit and entry points of major cities and keep a strict watch on anti-national elements. Electronic surveillance has been increased and extra security cover extended to all religious places in the capital besides closing of air space for traffic.